Globaler Kalender des Math. Inst. The computational simulation of advanced high strength steels, incorporating phase transformation phenomena at the microscale, on the future supercomputers developed for exascale computing is considered in this project. 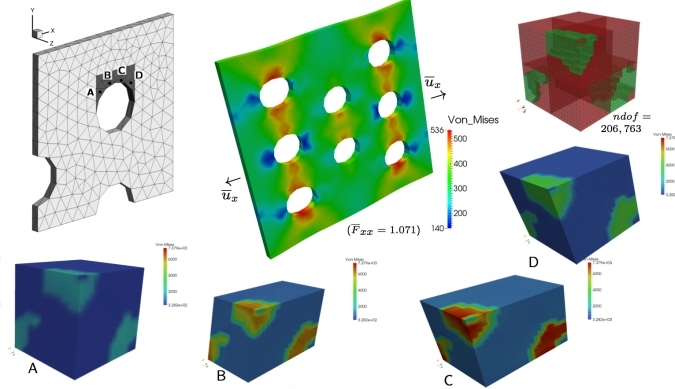 To accomplish this goal, new ultra-scalable, robust algorithms and solvers have to be developed and incorporated into a new application software for the simulation of this three dimensional multiscale material science problem. Such algorithms must specifically be designed to allow the efficient use of the hardware. Here, a direct multiscale approach (FE2) will be combined with new, highly efficient, parallel solver algorithms. For the latter algorithms, a hybrid algorithmic approach will be taken, combining nonoverlapping parallel domain decomposition (FETI) methods with efficient, parallel multigrid preconditioners. Engineers, mathematicians and computer scientist work closely together in this project. We refer to our approach, combining FE2 with FETI-DP as FE2TI-approach.The envisioned scale-bridging will still require a computational power which will only be obtainable when exascale computing becomes available. FE2 computation with a realistic microstructure and using FETI-DP on each microscopic problem.